This versatile skirt steak recipe is offers great possibilities for a meal all its own; as the centerpiece for an awesome salad; or even with breakfast – especially huevos rancheros. Skirt steak is an affordable cut of steak that can easily be incorporated into many meal options and is an excellent choice for a flavorful and easy to make recipe for your George Foreman Grill. Combine steak, Worcestershire sauce, pepper and salt and let marinate for at least 15 minutes. If you can let it go for a couple of hours or even overnight – all the better, but 15 minutes will work just fine if need be. While steak is marinating, in a large bowl combine corn, chopped onion, cilantro, garlic, peppers and lime juice and mix well. Some chopped jalapeno pepper will had some heat if desired. Preheat your Foreman Grill (or any other indoor press grill) for at least 5 minutes with the lid closed. Grill the steak for about 3-4 minutes depending on thickness for medium rare doneness. 4- 5 minutes for medium, 5-6 minutes for well done. Remove from grill and let steak rest on a plate for approximately 5 minutes. 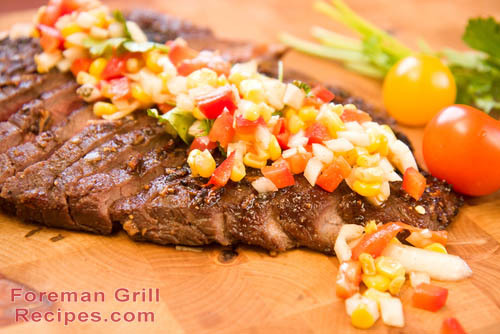 Serve with fresh corn salsa generously topping the steak. You can also place the salsa and cooked steak in a container and serve cold over a fresh salad. Make a terrific lunchtime meal to bring to work. Your co-workers will be envious of your delicious looking flank steak salad!